When it comes to an exhibition, you will want to choose a stand design that best showcases your brand and fits the purpose of the event. Two popular styles of exhibition stands include shell schemes and truss stands. But which type of stand is best for what you’re trying to achieve? Here is a breakdown of two of the most popular stand designs so you can decide which will suit you better. Shell schemes are a type of booth that include 3 (or less) panelled modular walls supported by a frame. With this, a board containing your company name can be placed across the top of the frame, and carpet is often used to decorate the floor. The empty set design allows you to decorate and completely personalise your set design to your needs. Often, lighting is offered as an extra, as well as the option to add electrical sockets and display equipment. Sometimes this will be included in the initial cost, but it is best not to assume and contact the exhibition organisers if you have any questions. How can you use shell schemes? Your stand is key in helping portray your company and products, so it is crucial for your stand to reflect this. Wall panels can be decorated with posters, graphics, charts and photos – so make sure to be aware of the stand size before you go printing huge graphics that then won’t fit. However, it does mean your graphics can be interchangeable, again leading to more customisation opportunities within your stand design. The space inside the booth can be used as you wish, to include banners, pop ups, stands and tables, but make sure you leave enough space to stand yourself! Your stand is meant to be inviting and entice people into conversing about your brand, so utilise the space you’re given to your advantage. This stand is completely compact and sleek – you don’t use any of your floor space in the construction, and the thinner walls themselves aren’t weak despite their composition. Shell schemes are often provided by exhibition organisers which is the perfect option for the exhibitors using public transport or smaller cars to get to their exhibitions. It’s a fuss-free way of doing exhibitions and perfect for those of us who want a really quick and easy set-up. Shell schemes, however aren’t as universal, it is not a ‘one size fits all’ approach that can be used, unlike truss stands, where parts can be added or taken away to fit the shape or size of the event. 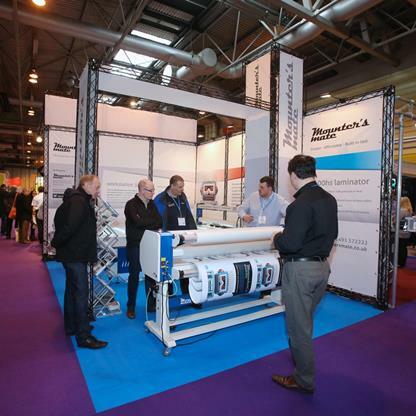 These stands are widely used at exhibitions so you won’t stand out by using a shell scheme stand, imagine an exhibition full of the same stand but different graphcs – this could potentially happen at some exhibitions. Truss stands are sections of metal or plastic bars forged together to create a lattice of material that fits together to form your stand. The stand comes in different shapes and sizes, allowing you to fix them together to create a uniquely shaped or heighted stand to suit your needs. These are completely modular which means extensions can be added or removed at any time depending on your given exhibition space. How can you use truss stands? Plastics and resins with thin tubing frameworks are being used by more and more manufacturers, making them more lightweight and flexible in terms of adjusting for space and height purposes, which is brilliant for hanging professional graphics. Be sure to check with the manufacturer the load bearing specifications before planning your stand – 200m2 stands come with a light fixing and table, but other exhibitors will have different specifications about what can and can’t be used depending on the material the stands are built from. One of the huge benefits of truss stands is their flexibility in terms of customisation. There are almost no limits in terms of size, height and shape as parts can be fixed together to build these stands to any requirements. The durability of the stands is not to be doubted either – they are often considered much better for larger graphics and displays due to their higher load capacities. This stand will make you stand out from the crowd, in a sea of shell scheme stands you stand will tower over them and attract attention. The cons of truss are that they are often bulkier, and dependent on material, and you do have to be able to transport your stand from event to event with the space to assemble and de-assemble your stand. Overall, the type of stand you choose really depends on where you’re exhibiting and for what purpose of your stand is. Truss stands suit both indoor and outdoor exhibitions equally due to their adaptable nature, whereas crammed inside exhibitions may suit shell schemes more as there is more chance to use the assigned space you’re allocated. If you need more information on truss stands and what their benefits could do for your company, please see our page for more information or get in contact today.